Cloudbuilts platforming-as-time-trial-racing premise puts Sonic to shame, but its visual design detracts rather than supports it. 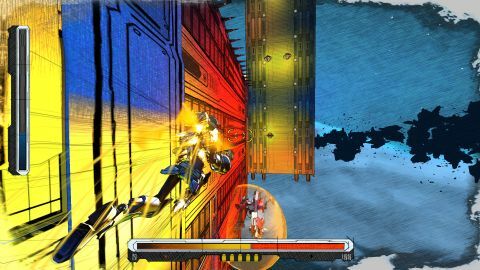 Cloudbuilt succeeds where Sonic The Hedgehog has failed for almost two decades. It's a 3D platformer that challenges you to speed through levels, jumping, wall-running, and shooting enemies along the way. It's a little ugly, but its short, devious levels are so much fun to beat, I fear for my wrists. Since the move to 3D, Sonic hasn't found a good way to express speed without undermining player control. The hedgehog's whole schtick is that he's fast, but landing precise jumps in three dimensions at high speeds is really hard, which means a lot of death and frustration. Sonic Adventure got around this by making things easier—borderline automatic—with loops and zip lines that play themselves. Cloudbuilt's solution is much better. It embraces the inherent difficulty with the structure of a racing game, inviting you to play and replay very challenging, short levels. You'll die hundreds of times, but restarting is a quick and painless part of the process, as in Super Meat Boy or any time trial racing mode. The (unfortunately designed) character has a jetpack for dashing forward, double jumping, and wall running. These maneuvers all drain the same recharging energy bar, so they can't be used carelessly. There's also a gun, which sometimes needs to charge before taking down tougher enemies. It's not a shooter by any means, but what shooting there is fits in nicely as another thing to juggle while you're trying to hit those jumps. The gun doesn't change throughout the game, and enemies act mainly as stationary traps. You can dodge them or even take less populated paths, but if you're able aim and clear them out of the way while you're doing everything else, you'll find some of the quickest routes, and look really cool while doing it. Above: An official trailer for Cloudbuilt, so you can see it in motion. In each level, floating blocks, walls, and enemies are arranged like obstacle courses. The designs get harder and harder, but there are no new abilities to make them more manageable. I earned every finish line by becoming a better player. All of the levels seem impossible at first, but after two dozen or more attempts I can always hit that perfect run. I jump from wall to wall blasting enemies and use the dash right as I hit a launching pad to catch huge air, skipping over an entire maze that was giving me trouble before. Success . When I finally reach the end, I feel like I did something extraordinary. I only wish there were a video replay feature so I could admire my victories. A good racing game is a nearly bottomless well, and Cloudbuilt's core concept goes almost as deep. At first, I just wanted to get to the end of each of the 22 levels, which in the latter half of the game is enough of a challenge to keep you busy for hours. Then I wanted to do it as fast as possible, on different paths, and with the highest rank. Cloudbuilt motivates these repeat attempts with leaderboards, special conditions (no gun, one hit deaths), and extra lives for better times, which are useful in solving later levels. It's unfortunate that Cloudbuilt's ugly visual style is, seemingly unintentionally, one of the things that makes it so difficult to play. Later later levels are packed with visual cues: slippery surfaces, health pick ups, enemies that require charged shots as opposed to regular shots. By the time I got there, I understood how to deal with each, but the textures and color palette are so garish that it's unnecessarily hard to figure out what's what at 100mph. It's not just an aesthetic issue—the game's slapdash visual style impacts how it plays. When I see a wall with a huge "up" arrow printed on it, I instinctively want to run up it. Here, those arrows and other decorations just confuse or point me in the wrong direction. Rather than functional, Green Hill Zone 1-type surfaces that scream “this is a good place to land,” and red and silver spikes that scream the opposite, Cloudbuilt is a visual shouting match where everything is speaking gibberish. Every texture is too detailed and shadow and depth are emphasized with busy cross etchings. Its a little gauche, as is the story, which is told in laborious voiceover between levels. I would tell you more about it, but I heard “the inferno of emptiness that waits outside” early on and ignored the rest. That I had so much fun with Cloudbuilt despite it being distractingly ugly is a testament to how strong its fundamentals are. The games I'm most obsessed with literally hurt my hands, and this has destroyed my knuckles (which usually doesn't happen with mouse and keyboard games), tempting me to try again and again for hours. Cloudbuilt has figured out how to be a super fast platformer that's both brutally hard and fun. Take notes, Sonic.